← ‘The Field’… The End? The Field – The Big Première! The day before, myself (Joe) and Callum were on BBC Radio Humberside promoting ‘The Field’ and local filmmaking in Hull. We arrived nice and early (Up early? A shocker I know!) for our 8:45 slot. Luckily we got longer on air than we should have done – a good ten minutes slot. We got some good feedback from it, with a number of people getting in touch offering locations for future films and events to promote our work. The Sunday arrived, the posters had been printed and mounted on the walls. We had about 100 – 120 guests. The actors all turned up with their families – the kids in the film were all looking especially dapper! 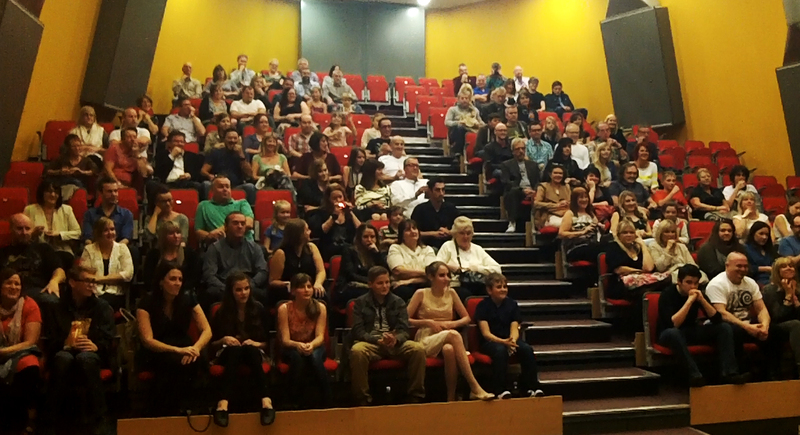 A great turn out for our film’s première! 45 minutes later. There had been laughs. There had been jumps. There had been some freaking out. ‘The Field’ was a huge success! Everyone loved it! We had some great feedback from people telling us how great the picture quality was, the story, the sound effects, the music, the acting and the effects! Everyone stuck around afterwards, talking about what was in the field at Old Joe’s Farm. All-in-all it was a huge success! Posted on October 8, 2013, in Our Films and tagged Arts and Entertainment, BBC Radio Humberside, east yorkshire, field, hull, independent film, indie film, Kingston Upon Hull, Sound effect. Bookmark the permalink. Leave a comment.